A good smile involves in it more than just healthy teeth and gums. It is a blend of symmetry, color, shape and lines that create a balanced harmonious smile. 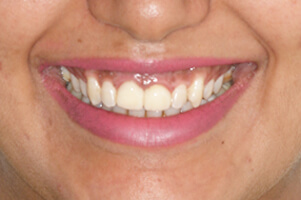 The various attributes of a smile can be favorably altered for a complete change in the smile. Smile designing or smile makeover deals with the remodeling of the teeth and supporting structures so as to give a complete new look to the patient. The treatment involves one or a combination of procedures mentioned below. Microabrasion is the method of removing white spots on teeth and superficial enamel stains. This method removes micro layers of enamel to eliminate minor defects and spots. A desirable and effective method of eliminating unattractive dark color stains from the tooth surface. Does not involve altering the shape and size of the tooth. 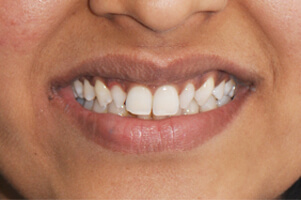 Some times the gums appear brownish / blackish due to excess melanin pigmentation. In such cases the superficial layer of the gums, which contains the pigments is removed so as to make them look like normal colored gums. 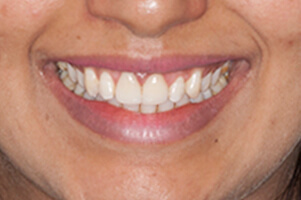 A "Gummy Smile", where too much of gums are seen when smiling, can be recontoured/repositioned for a wider, friendlier and a more open smile by the use of cosmetic gum recontouring. A laminate / Veneer is a thin layer / shell made from either porcelain or composite used for esthetic improvements in cases of mild overlapping, severe discoloration and gaps between teeth. The most effective solution with least or no preparation of the tooth is the use of Thineers. Dental material advances are able to offer ‘contact lense’ thin, but strong pieces of ceramic which can be stuck to the tooth surface for enhanced esthetics..
Teeth have not escaped current fashion trends either. To get that different look there are a lot of options now available for fashion lovers. Thin metal or crystal adornments can be bonded onto the tooth. These can be removed and replaced at will and do not involve cutting of tooth structure. Dental tattoos are a reality in some parts of the world wherein a thin colorful veneer with desired inscriptions or pictures is temporarily or permanently bonded onto the tooth. A pleasing smile not only involves just healthy teeth and gums but symmetry, color, shape, and lines that create a balanced peaceful smile. Many of us have good teeth and gums but unhappy with their smile, for that an aesthetic dentist will evaluate your smile for its missing, predominant or underplayed features and proceed with their correction through the various procedure. This is called Smile Designing. Can I change the tone of my teeth? If you are not happy with the shade or discoloration of your teeth, it is possible to improve the appearance of your teeth by a procedure called Teeth Whitening. It is a simple procedure with expected results and can be done either at a dental clinic or at home. Surface staining caused by smoking or excess consumption of tea or coffee and wine can be effectively and conservatively excluded for an immediately brighter smile.